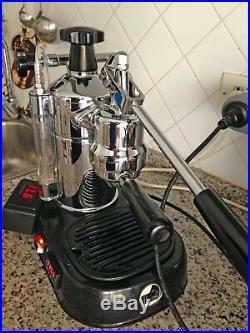 La Pavoni Professional 220V (post-2000 version with brass piston, not plastic). See youtube demonstration video links below. 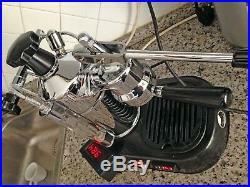 It is in perfect working condition and has been modified. Improvements that allows full temperature control. 1 PID electronic temperature control to set boiler temperature with an accuracy of 0,1°C/F. It is installed inside the base on the left side, where you can see the LCD and control buttons. Sensor is on the back surface of the boiler, at the minimum water level height. It is a thin film RTD sensor. 2 Fast thermometer with two. Temperature sensors (lever switch to choose one of the two sensors). Shower screen sensor above the coffee puck. It measures actual brewing water temperature during extraction. Boiler temperature together with group temperature will determine brewing water temperature. Sensor on the left external side of the group head to finely tune the extraction temperature by acting on the lever. Note that this allows to change quickly and with high precision the temperature between coffee shots. Useful to explore different flavors and to find the optimal temperature for a given coffee. 1 Boiler works below or very close to boiling water point, hence it can be quickly refilled with water at any time for unlimited continuous coffee production without the need to wait the machine to cool down from the commonly used 0,8 bar saturated steam pressure (that is 117°C). 2 High steam pressure like in professional machines, max 2 bars (plus pressure control on the fly). Pressure is related to boiler temperature shown by the PID, no need to have a gauge. A double switch is installed to add a second white switch to bypass PID control and turn on the machine at full power to reach the desired steam pressure. Note that the safety valve is carefully modified to open at. About 2 bars (136°C) to limit the maximum boiler pressure for safety reasons. Note: the machine can't make coffee and frothing milk at the same time because the boiler is at very different temperatures to achieve the best possible performance. Anyway the machine goes from coffee mode to steam mode very quickly. Is used to achieve a boiler pressure of about 0,8 bar whatever is the boiler temperature. It is automatically controlled by the stock pressurestat. It has a dedicated switch for optional manual control (for example to switch off to refill boiler with water or to use a lower preinfusion pressure). The pump must be turned on after the machine warm up. 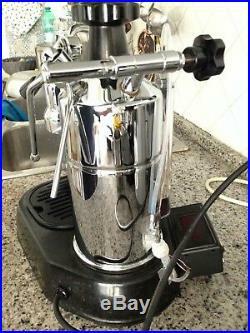 The machine has a naked portafilter and a s. Ilicone sheet under the base to enhance stability when pulling the lever. It comes with single and double filter baskets and original box. Sensors are mounted on the chrome surface by high temperature resistant tapes. Tapes adhesives are strong and long lasting, and easily replaced when needed. The machine is reliable and safe to use and can be left on for hours. It has been tested for over a year without any issues. 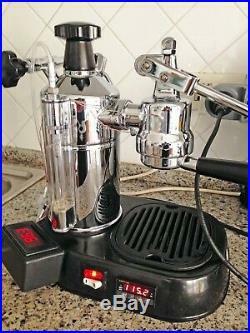 The maintenance is no different from that of a standard Pavoni. Electronic parts can be accessed by opening the base or by removing the thermometer lcd from the little external box. 1 Double shot of espresso at 92°C. 2 Double shot of espresso at 90°C (15 g of coffee) and milk frothing for a cappuccino. 3 Milk frothing at 134°C (2 bar). Where i make several blank shots (made with a modified portafilter that simulate a coffee puck) at around 90 C°, then i change PID temperature setting and make some cooler shots. I refill the boiler, and finally i show milk. 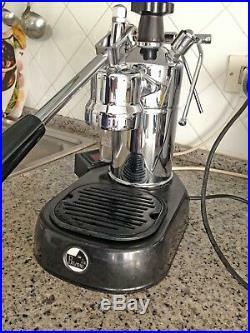 The item "La Pavoni Professional + PID kit electronic lever espresso coffee machine" is in sale since Monday, January 28, 2019. 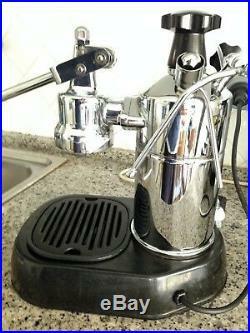 This item is in the category "Elettrodomestici\Macchine da caffè\Espresso". The seller is "castorin8" and is located in Roma. This item can be shipped worldwide.